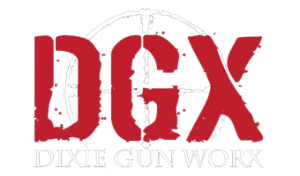 What is the benefit of choosing a Dixie Gunworx custom firearm over a commercial store firearm? We do not build and sell our AR-15’s in the conventional sense. For example, if you walk into a traditional gun store looking for an AR-15, they will show you a pre-made package deal; meaning that the gun is put together with specific stocks, grips, length, flash suppressor, etc. The only way that you can change these predetermined parts is to purchase additional parts at an additional cost. Instead of buying a basic firearm, that has need for several upgrades to make it what you want, why not buy the firearm that you are looking for with the parts that you want in the first place? Most people spend 1.5 times the original price of the traditional firearm in order to upgrade it to what they really want. When you walk into DixieGunworx, we take the time to find out what you need in a firearm. When you have a specific use for the firearm such as: home defense, hunting, SWAT, competition, recreational use etc. you want a firearm that is going to perform for that specific purpose. We will give you exactly what you want in a firearm the first time you buy. We will walk you through the process of selecting top of the line materials that will give you the best results. Building a gun in this way, choosing exactly what you want, actually becomes much more cost effective, and gives you a premium quality weapon that you have no need of upgrading in the future. Are there any warranties available for DGX firearms? All of the products used to build the firearm have a warranty covering them against any defect in the workmanship and material. We stand behind our products and will detect any issues with specific parts during the building process. While we do not have a set time allotted warranty for the firearm itself, if for some unforeseen reason the firearm has an issue, we will do our best to make it right and most of the time this coverage will not be at the customer’s expense. What delivery options do you offer at DGX once I purchase a firearm from you? Once you have decided to purchase from us, there are a few options for pickup/delivery. If you are able to come to the store to pick up the rifle from us, you will be responsible to pay for the rifle, our transfer fee of $15.00 which transfers the rifle to your name, and the Utah Taxes. If you are unable to come into our store, we also have the ability to ship the rifle to any FFL licensed dealer in the United States. We can NOT ship out of the United States. Shipping normally costs between $15-25 dollars. If we ship the rifle to a FFL dealer in the state of Utah you will also have to pay Utah Taxes on the purchase. If the firearm is shipped outside of the state of Utah, no taxes will be charged. What is the process to build a custom firearm with DGX? First, we sit down together and discuss your plans of use for the firearm. Then, we talk about what models you like, and what preferences you have in a firearm. Then, we take the time to go through every aspect of the rifle and all of the options for each part. We explain the differences between each choice, and help you decide what parts will best fulfill your plans of use for the firearm. As you select the premium parts that you want in order to start your build, we keep a list and begin calculating the total price for everything that you want. When we have gone through each of the components of the rifle, we allow you to review the parts list and price for everything. Once you look over the final figures and price for your custom firearm, you are then able decide if you want to buy or walk away. If you do decide to buy from us, we require a 70% down payment in order to start the build. How long does it take to build a custom firearm? We build every rifle from scratch. Because of this, we may not always have every single component that you are looking for in stock at our store. If we are waiting on parts to be sent to us from our manufacturers, then that will delay the build time, and require you to wait a little longer to receive your finished product. Most of the time the total wait time for your weapon to be built is one to two weeks. We do our best to keep your wait time to an absolute minimum so that you can enjoy your firearm as soon as possible. Cerakote is a ceramic based paint that was designed for high heat applications. There are 40+ basic colors and any of them can be mixed. Hydro-Dipping is a water based print transfer system. You can see Hydro-Dipping being done on many applications; especially firearms, archery equipment, hunting equipment, vehicle dash boards, ATV plastics and parts etc. There are thousands of patterns to choose from. Think of the difference between painting and applying wallpaper to your wall. Cerakote is like painting the surface, while Hydro-Dipping is putting a print on top of a surface.